As Christians, our year is divided into six seasons – the season of Advent, Christmas, Epiphany, Lent, Easter and Ordinary Time. These seasons follow and highlight the story of our faith. In the season of Advent, we anticipate the arrival of Jesus walking with us on this Earth. For the season of Christmas, we now celebrate he has come – God in human form through Jesus the Christ! In the season of Epiphany, we remember the Wise Men coming to bring Jesus gifts and by their coming, they “reveal” (meaning of the word epiphany) to the world the great king has come to us all, and he is due honor! 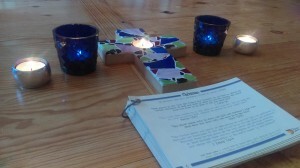 In the season of Lent, we are preparing our hearts and minds for Easter, the mark of Jesus’s death and resurrection. In the season of Easter, we celebrate our birth through his death and resurrection. This is the central marker in the year of our faith, and all else hinges on this season of focus and worship. In the season of Ordinary Time, the early church used this time to focus on the various aspects of our faith and specifically our mission in the world. So, in this year of 2016/2017, we have just finished our season of Advent – anticipating Jesus, his coming into our day to day! And now we begin the season of Christmas – 12 days of focus on God incarnate in the human form of Jesus. As I reflect on this truth, I am reminded of his way on this earth! In humbleness and strategy, he served the need, found the hurting and offered his hand. So, we too do the same. The Hagan clan is calling “12 days of RAK” (Random Acts of Kindness). I shared this vision with the kids a few days ago and then invited them to go to their stash, retrieve the gift cards or money and meet us back at the table. We pooled our resources and began making a brainstorming list. We looked at the gift cards – 2 Starbucks, 1 Old Navy and a Dairy Queen. We could do the “pay for the car behind us” with the Starbucks. With the Old Navy, we thought to buy some jackets and take to Mission Arlington. With the Dairy Queen, we are going to buy a bag of burgers and take them to the corner by Target and Shell. There are always “sign-laden people” there. Then we thought of the opportunities. Let’s all write a note of encouragement to someone in our sphere. Speak a blessing over them and thank them for who they are in our life. We are also going to do a day of prayer. Make a list of those people and organizations and every hour pray. We are also going to get on our church’s website and send some support to a missionary family that has started an orphanage and school. And with the cash we pooled, we thought of buying some rolls of quarters to take to a laundry mat. With all of these acts, I made a card that we share with the gift, and of course, we pray over each exchange and leave them with God’s blessing. This is our list as of now; still scripting it and perhaps Father will be adding his own ideas to it. In this season of Christmas, we are focused on the gift – his gift of life and love (John 10:10) and the escape from the corruption of the world through Jesus (2 Peter 1:3-4). I am praying it centers our children on the gift as well. Beyond the social media of their day to day, beyond the focus on self and what I got this Christmas, beyond the pace of school and sports, beyond the roller coaster of relationships – there is more. There is love. We have the incredible opportunity to get in the middle of love and be a vessel of his love to those around us. This purpose gets to the greater story and it is in this greater story that my children find strength and a vision for their own journey. 1. Share our story with your family. 2. Pool your resources – time, talent and treasures. 3. Make a list of people and places you could serve. 4. Make a card to give with your gift. You can use ours if you want. 6. Share with us your adventure! It really is fun. We did the Starbucks deal for the past two days, and it was not only rich to buy the drink and share the card but to tell the story to the Starbucks worker was equally as great! Today is note writing day! And believe me, it is not easy. It isn’t as though all three of my kids are saying – what’s next? Let’s get to it. 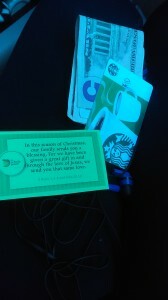 In fact, our first two acts of kindness were Starbucks, non-evasive and they got a nice drink out of the deal. Today, to write our notes, I will pull them from their devices and remind them of what we are doing. Hopefully, they will have a good attitude about it, but I will have to let you know. All the while, I will be the cheerleader to this endeavor while combating the constant to-do list that races around in my head. I want to get all the Christmas decorations put away. I need to plan for next semester, and the girls have a literary analysis they have to write over the break, and . . . . We will push back our share of “wild animals” I promise you (C.S. Lewis). But if you are like me, I know that this journey of parenting is a relentless one. The enemy is hard at work to distract and busy our families. But it is in these simple endeavors that we adventure together in his greater story that is the prize. We pool the resources he has given to us. We give them over to a greater need. We extend our hand to others, and we share the gift we have been given. When our children leave our home, it is these adventures they will remember. These prayers they will carry with them, and this purpose will hopefully infiltrate their homes.